Lineage. Constituted as 25 Pursuit Squadron (Interceptor) on 20 Nov 1940. Activated on 15 Jan 1941. Redesignated: 25 Pursuit Squadron (Fighter) on 12 Mar 1941; 25 Fighter Squadron (Twin Engine) on 15 May 1942; 25 Fighter Squadron on 1 Jun 1942; 25 Fighter Squadron, Single Engine, on 28 Feb 1944. Inactivated on 12 Dec 1945. Activated on 15 Oct 1946. Redesignated: 25 Fighter Squadron, Jet Propelled, on 19 Feb 1947; 25 Fighter Squadron, Jet, on 10 Aug 1948; 25 Fighter-Interceptor Squadron on 1 Feb 1950. Discontinued on 8 Jun 1960. Redesignated 25 Tactical Fighter Squadron on 18 Jun 1965. Organized on 20 Jun 1965. Inactivated on 31 Jul 1990. Redesignated 25 Fighter Squadron, and activated, on 1 Oct 1993. Assignments. 51 Pursuit (later, 51 Fighter) Group, 15 Jan 1941-12 Dec 1945. 51 Fighter (later, 51 Fighter-Interceptor) Group, 15 Oct 1946 (attached to 51 Fighter-Interceptor Wing, 1 Jul-24 Oct 1957); 51 Fighter-Interceptor Wing, 25 Oct 1957-8 Jun 1960. Tactical Air Command, 18 Jun 1965; 33 Tactical Fighter Wing, 20 Jun 1965; 8 Tactical Fighter Wing, 28 May 1968; 432 Tactical Reconnaissance (later, 432 Tactical Fighter) Wing, 5 Jul 1974; 3 Tactical Fighter Wing, 18 Dec 1975; 18 Tactical Fighter Wing, 19 Dec 1975; 18 Tactical Fighter Group, 1 May 1978; 51 Composite Wing (Tactical) (later, 51 Tactical Fighter Wing), 1 Feb 1981-31 Jul 1990. 51 Operations Group, 1 Oct 1993-. Stations. Hamilton Field, CA, 15 Jan 1941; March Field, CA, 11 Jun 1941-10 Jan 1942; Karachi, India, 12 Mar 1942; Dinjan, India, 22 Nov 1942 (detachment operated from Sadiya, India, 6 Nov 1942-2 Apr 1943; Jorhat, India, 2 Apr-14 Sep 1943); Yunnani, China, 14 Sep 1943 (detachment operated from Paoshan, China, 30 Nov 1944-Jan 1945; Liangshan, China, 10 Jan-Feb 1945; Poseh, China, 4 Feb-28 May 1945); Loping, China, Sep-Nov 1945; Fort Lewis, WA, 11-12 Dec 1945. Yontan Afld, Okinawa, 15 Oct 1946; Naha Afld, Okinawa, 22 May 1947; Itazuke AB, Japan, 22 Sep 1950; Kimpo AB, South Korea, 23 Oct 1950; Itazuke AB, Japan, 4 Jan 1951; Tsuiki AB, Japan, 22 Jan 1951; Suwon AB, South Korea, 20 Jul 1951; Naha AB, Okinawa, 1 Aug 1954-8 Jun 1960. Eglin AFB, FL, 20 Jun 1965-25 May 1968; Ubon RTAFB, Thailand, 28 May 1968; Udorn RTAFB, Thailand, 5 Jul 1974; Clark AB, Philippines, 18 Dec 1975; Kadena AB, Japan, 19 Dec 1975; Suwon AB, South Korea, 1 Feb 1981; Osan AB, South Korea, c. 10 Nov 1989-31 Jul 1990. Osan AB, South Korea, 1 Oct 1993-. Aircraft. P-40, 1941-1945; P-38, 1944; P-51, 1944-1945. P-47, 1946-1947; F-80, 1947-1951; F-86, 1951-1960. 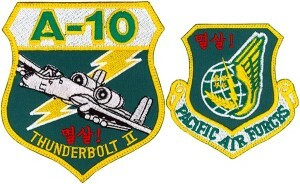 F-4, 1965-1980; A-10, 1982-1989. OA-10, 1993-; A-10, 1998-. Operations. Combat in China-Burma-India (CBI) Theater, 2 Sep 1942-28 May 1945. Combat in Korea, 22 Sep 1950-27 Jul 1953. Combat in Southeast Asia, c. 29 May 1968-28 Jan 1973. Supported the evacuation of US personnel from Phnom Penh, Cambodia and Saigon, South Vietnam, Apr 1975. Flew strike missions against Koh Tang Island and Khmer Rouge gunboats during the Mayaguez incident, 13-15 May 1975. Not operational, Aug 1980-Jan 1982 and Nov 1989-Jul 1990. Trained combat ready pilots in forward air control (FAC), air strike control, combat search and rescue, close air support, and air interdiction in the defense of the Republic of Korea (ROK), 1993-. Hunt VI; Commando Hunt VII; Vietnam Ceasefire. Decorations. Distinguished Unit Citation: Korea, 28 Nov 1951-30 Apr 1952. Presidential Unit Citation: Southeast Asia, 1 Jan-1 Apr 1971. Air Force Outstanding Unit Award with Combat “V” Device: 1 Jan 1967-30 Jun 1968; 1 Jun-30 Sep 1968; 22 Oct 1968-30 Jun 1970; 1 Oct 1971-31 Mar 1972; 1 Apr-22 Oct 1972; 18 Dec 1972-15 Aug 1973. Air Force Outstanding Unit Awards: 29 Aug 1958-19 Jan 1959; 1 Sep 1978-30 Sep 1979; 1 Oct 1979-31 May 1980; 1 Apr 1983-30 Apr 1984; 1 May 1984-30 Apr 1985; 1 Jul 1985-30 Jun 1987; 1 Jul 1987-30 Jun 1989; [1 Oct 1993]-30 Sep 1994; 1 Nov 1995-31 May 1997; 1 Oct 2002-30 Sep 2004. Republic of Korea Presidential Unit Citations: [22 Sep 1950]-30 Jun 1951; 1 Jul 1951-31 Mar 1953. Republic of Vietnam Gallantry Cross with Palm: [28 May 1968]-28 Jan 1973. Emblem. Approved on 22 May 1996.